Everton manager Ronald Koeman was left clinging on to his job after Alexis Sanchez, Mesut Ozil and Alexandre Lacazette provided the inspiration for Arsenal's 5-2 victory at Goodison Park. Even Wayne Rooney's recreation of his famous first Premier League goal as a precocious 16-year-old against the same opposition to put Everton 1-0 up early on could not mask the issues the Toffees face. It was a lead they never looked like holding and Nacho Monreal equalised just before the break, with Ozil, Lacazette - after Everton midfielder Idrissa Gueye was sent off - and Aaron Ramsey making it 4-1. Substitute Oumar Niasse pulled one back thanks to some comedic defending and Sanchez then had the final say. "This club makes you laugh/cry and go mad At moment it's breaking my heart bit by bit" - f ormer Everton goalkeeper Neville Southall (@NevilleSouthall) was left shattered. He has his critics but Ozil can certainly turn it on at times. He was the key man in Arsenal taking control of this game, heading in the Gunners' second goal and then providing the tee-up from which Lacazette made it 3-1. Sanchez also produced another fine performance. The prospect of the Gunners losing him and Ozil, who is currently being linked with Manchester United, continues to hang over the north London club. 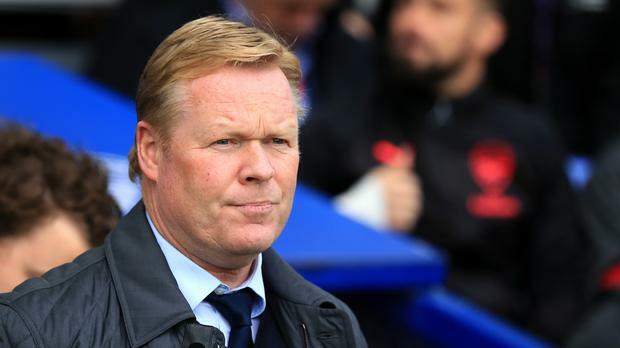 Koeman, whose side have slipped into the relegation zone, will not have enjoyed what he heard from either set of supporters. There were boos from Everton fans, including when he decided to take off Dominic Calvert-Lewin, while Arsenal supporters sang that he was going to be "sacked in the morning". What really counts, in terms of Koeman's future, is the opinion of the Toffees' majority shareholder Farhad Moshiri, who was watching from the stands and no doubt feeling concerned about what he saw. This was the first time Ozil, Sanchez and Lacazette had started a game together. Everton: Jordan Pickford 6 (out of 10), Michael Keane 5, Phil Jagielka 5, Ashley Williams 5, Jonjoe Kenny 5, Nikola Vlasic 5, Idrissa Gueye 5, Leighton Baines 5, Gylfi Sigurdsson 5, Wayne Rooney 6, Dominic Calvert-Lewin 6. Substitutes: Tom Davies (for Williams, 46 mins) 5, Ademola Lookman (for Rooney, 74) 5, Oumar Niasse (for Calvert-Lewin, 75) 6. Arsenal: Petr Cech 6, Laurent Koscielny 6, Per Mertesacker 6, Nacho Monreal 6, Hector Bellerin 7, Aaron Ramsey 7, Granit Xhaka 7, Sead Kolasinac 6, Mesut Ozil 8, Alexis Sanchez 8, Alexandre Lacazette 7. Subs: Jack Wilshere (for Lacazette, 77) 7, Francis Coquelin (for Ozil, 82) 6.